Welcome to Arbor House Open living and dining areas Comfortably furnished living room Living room has shelves stocked with books and games for you to enjoy Full kitchen for making those meals in Large dining room table adjacent to the kitchen Full bathroom on the first floor First bedroom with a queen sized bed Landing with cozy writing area Landing area with washer and dryer Reading nook on opposite side of landing Second bedroom with queen and full-sized bed Spacious yard Wonderful tree-filled backyard Arbor House a wonderful Cannon Beach getaway. Seeking a cozy, conveniently located escape for your next great beach adventure? Treat yourself to a sojourn among the trees and the seas at snug, friendly Arbor House. Set on a peaceful residential street in the desirable midtown area of Cannon Beach, Arbor House packs plenty of living and sleeping space into a small, lovingly decorated package. This two-bedroom, one-bathroom storybook home offers everything you need to rest and rejuvenate. On the first floor, you’ll find a fully stocked kitchen and open dining/living area. Here you will find lots of entertainment options, including a flat screen TV with DVD/VCR plus a stereo and a generous collection of kid-friendly board games for those rainy evenings. There is also a full bathroom on this level, plus a sofa bed perfect for entertaining any additional guests who come to call. Head up the stairs and step into a landing area that doubles as a small den, complete with a washer/dryer. Nearby, two more bedrooms await, one with a queen bed and a TV/VCR and another featuring both a queen and a full bed. Don’t forget to crack open the home’s windows to get the full Arbor House effect. You’ll love drifting off to sleep with the sounds of lapping waves and whispering pines for a lullaby. Outside, wander through the sprawling, grassy yard, or camp out on the private deck, where picnic tables and peek-a-boo Haystack Rock views await, making this perfect place to stage an outdoor meal. Ready to roam? Bring your walking shoes and leave the car parked in the large driveway — this home’s fantastic location makes it the perfect jumping-off place for exploring Cannon Beach on foot. 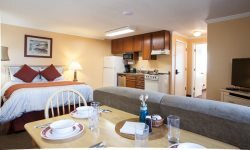 You will be just blocks from the action of Midtown Cannon Beach and a half-mile from the sights of Downtown Cannon Beach. Views of the trees or views of the seas — stop agonizing between the two and come for a visit to Arbor House, where you’ll happily revel in healthy doses of both. Cannon Beach Vacation Rentals offers these nearby homes as well: Haystack Roost, the Bungalow, and Elliott Way Cottage. All was nice, with the exception of the mattresses - especially in the second bedroom. They were very difficult to sleep in. The decor in this property also seemed really dated, but that didn't bother us at all, especially considering the affordability of the property. However, the mattresses will keep us from renting this house again. Thank you for your comments. We will relay your concerns regarding the beds to the homeowner. We hope you will join us again at Cannon Beach Vacation Rentals in the future.